Deployment: The boat is underway performing its assigned missions. Continuing in the celebration mode, the annual Christmas Party for the children of personnel assigned to the sub, was held on Dec. 15th. While the news of this Christmas Party is being included in the ‘Relief Crew News’ please note that the party funds are from the proceeds of our successful golf outings held each June, chaired by Don Elborne. 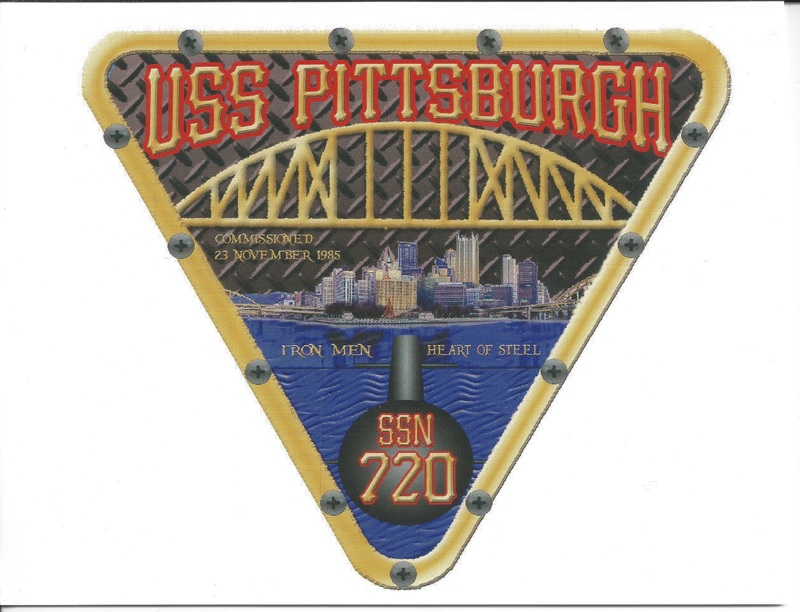 The USS PITTSBURGH Coordinating Committee established a Scholarship Fund in honor of the USS PITTSBURGH SSN 720 upon the occasion of its commissioning on 23 November 1985. The scholarship is a symbol of appreciation by the City of Pittsburgh and its individual and corporate residents toward the USS PITTSBURGH and its crew and dependents. Current and former USS PITTSBURGH crew and their dependents are eligible to apply for scholarships. The Relief Crew membership and contributions, the Pittsburgh Foundation, and our annual Kentucky Derby party provide funding and are helping sailors and their families. The following links provide scholarship guidelines and the application. Scholarship guidelines, information and instructions. Members of the Pittsburgh Council attended the Change of Command for the USS Pittsburgh, January 12 in Croton, Ct. The outgoing CO, CDR Neil Colston thanked the council for it's support including visits to the city by the crew, Christmas Party for crew's children and the scholarship program. It was the Pittsburgh Council's joy to welcome CDR Jason Deichler, incoming CO a son of Pittsburgh (a first for the boat), and family to the Pittsburgh Council Family. 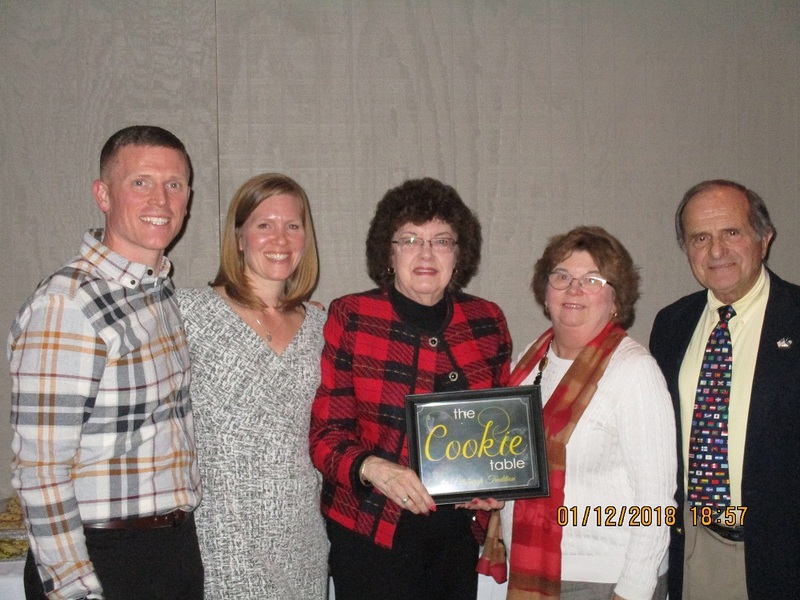 We all enjoyed a Pittsburgh tradition, "cookie table" at an evening gathering. 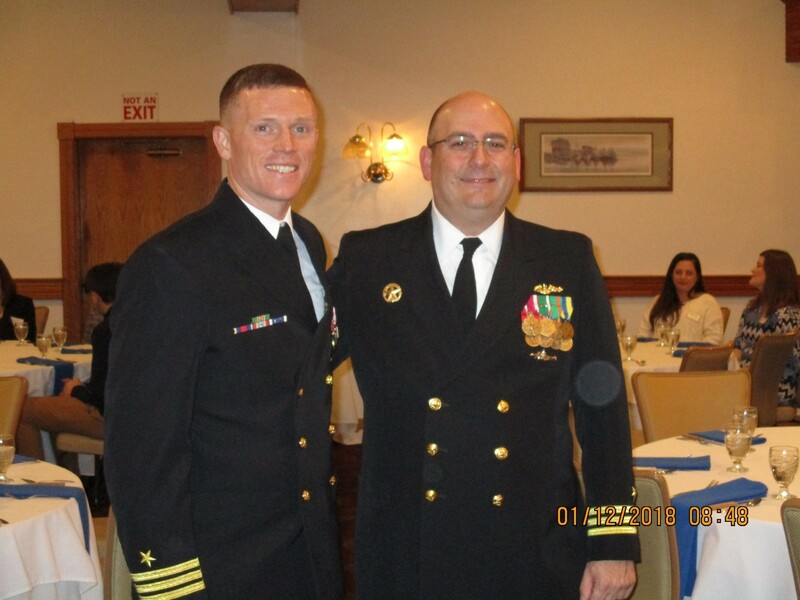 CDR Jason Deichler is on the left --he is the incoming CO, and CDR Neil Colston, outgoing CO at a breakfast for their families/special guests hosted by the Navy League, Pittsburgh Council. Jason M. Deichler, a native of Pittsburgh, Pennsylvania, received his commission in 1999 through the Naval Reserve Officer Training Corps after graduating from Carnegie Mellon University with a Bachelor of Science degree in Mathematics. Commander Deichler’s first assignment was USS WEST VIRGINIA (SSBN-736) (GOLD), where he led various shipwide divisions while completing four strategic deterrent patrols. Upon completion, he served as a Shift Engineer and Material Officer onboard MTS Daniel Webster (MTS-626) in Charleston, South Carolina. Reporting as the Engineering Officer onboard USS SPRINGFIELD (SSN-761), he completed a Central Command Deployment while earning the Submarine Squadron Two Battle Efficiency “E” award. As the Executive Officer on the USS ASHEVILLE (SSN-758), he completed a Western Pacific Deployment, earning a Meritorious Unit Commendation. His shore tours include Associate Professor of Naval Science at The George Washington University, Material Officer for Submarine Group Two and the Nuclear Officer Program and Submarine Officer Community Manager on the OPNAV N133 staff. He holds a Master of Engineering Management degree from Old Dominion University. He is entitled to wear the Meritorious Service Medal (two awards), Navy Commendation Medal (five awards), and other various personal, unit and service awards. Commander Deichler is married to the former Michelle Hoover of Pittsburgh, Pennsylvania. They have four children: Hannah, James, Matthew and Ian. Pittsburgh Council members Katherine Kersten, Polly Bozdech-Veater and John Caspero, attended the Change of Command. The "cookie table" is a long standing Pittsburgh tradition usually done at weddings. Cookies all made by relatives---CDR Deichler's wife Michelle mom's and friends made dozens upon dozens of cookies. 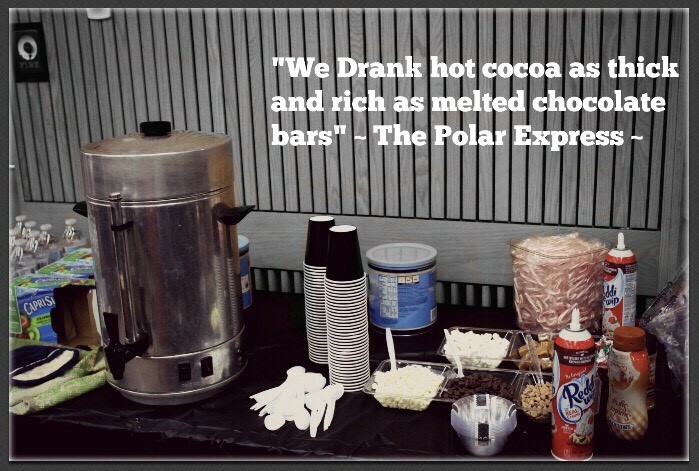 The theme of the event was The Polar Express. The weather proved to be a challenge on the day of the event as it was our first true snowfall of the year and the roads were less than forgiving. Even so, the 10 families who did make it out to the event, filled their bellies with French Toast while sipping on hot cocoa from the elaborate hot cocoa bar. The twenty kids entertained themselves with crafts, toys, games and of course a movie in the background. Each kid had a stocking with their name on it and a bell to share in the magic of The Polar Express, those kids 11 and under were gifted a gift card to Toys R Us from the USS PITTSBURGH Relief Crew. 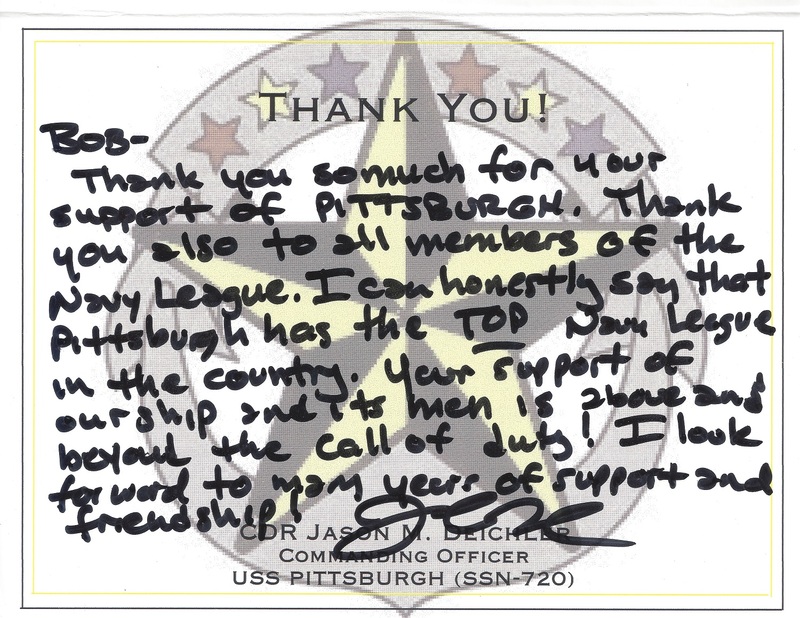 A generous gift and one that is much appreciated by the families of the USS PITTSBURGH. The Children Christmas party has been a long-standing tradition of the Pittsburgh Council and has been part of the fabric of the council since the USS Pittsburgh was commissioned in 1985. The majority of the funds come from the outstanding golf outing (chaired by Don Elborne for over 23 years). In 2018 the Golf Outing is scheduled for June 1. 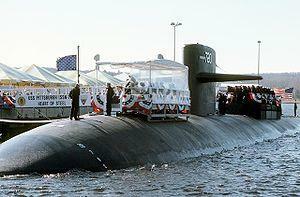 The USS PITTSBURGH SSN-720 Crew, on a port stop, holding 100 terrible towels and rooting for the Steelers. 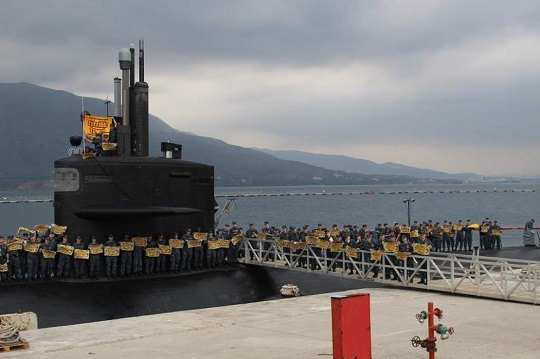 The submarine veterans of the Requin Base in Pittsburgh, sent them the towels. 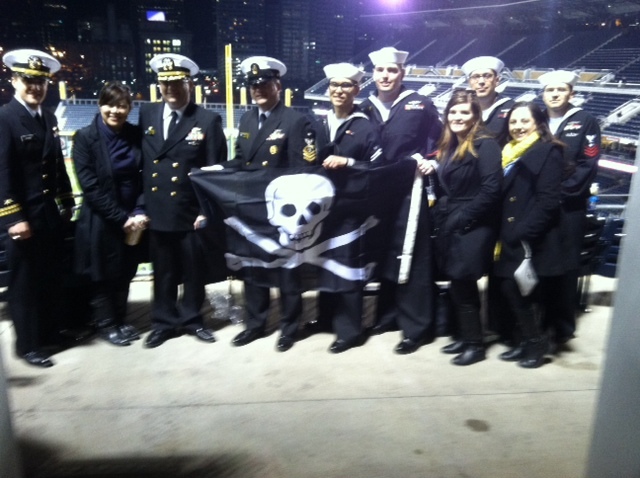 USS Pittsburgh Commanding Officer and crew members visit Pittsburgh April 3 - 7, 2016.. One of their activities was to attend a Pittsburgh Pirate game. The crew and spouses display the Pirate flag - The Jolly Roger. And the Pirates won!